MindStore Online is a brand new platform that enables you to interact with Jack Black’s powerful Personal Development, Mindfulness and Transformation programs anywhere at anytime. After listening to the free introductory program, you can purchase additional programs, either from the MindStore Online website, or from within the mobile app.To get started please follow the steps below. To get started you will need to register for a MindStore Online account. (This is a new platform, so even if you are an existing MindStore customer you will need to register). Click ‘Register Now’ at the top right corner of your browser page. Complete the simple registration form and submit. Confirm your registration by clicking on the link provided in the email that we will send you. You can now access MindStore Online using your email address and the password you created. If you have already registered, please enter your account details here. If not please follow the ‘New to MindStore Online? Register now’ link. Now that you have a MindStore Online account you can access our powerful Personal Development and Mindfulness programs. You can purchase programs on the website, or direct from within the app. Any programs you purchase will appear in ‘My Library’ and will be accessible through your MindStore Online account on any browser, as well as through the App. When you access your chosen program you will be introduced to our audio player, which is designed to be user friendly and will record the progress you are making. If you haven’t already done so, you can download the MindStore Online App from the Apple App store or via Google Play. With the App you can access all your MindStore Online Programs wherever you go. You can even download them to access them without Internet access. Step 5: How to use the audio player on computer and in mobile App. Below are annotated images showing you how to use the audio player on a computer and on our mobile App. Click this button to begin playing or to pause your session. Slide this bar to the left or right to move forward or backwards in the soundtrack. To select which Module/Day you wish to work on click on the drop down menu and make your selection. In this section you will be given an overview of the session to come. There will be useful notes, as well as any preparation required before you begin, so it is important to read this carefully before you begin. Your journal provides question prompts for you to consider. Click on any journal question and start typing your thoughts and observations. Your journal entries will be saved automatically as you type them. You can print your journal at any time. Just click where shown. Tap this button to take you to your MindStore Online Program library. This will take you to the Modules/Days playlist so that you can select a session to work on. n this section you will be given an overview of the session to come. There will be useful notes, as well as any preparation required before you begin, so it is important to read this carefully before you begin. 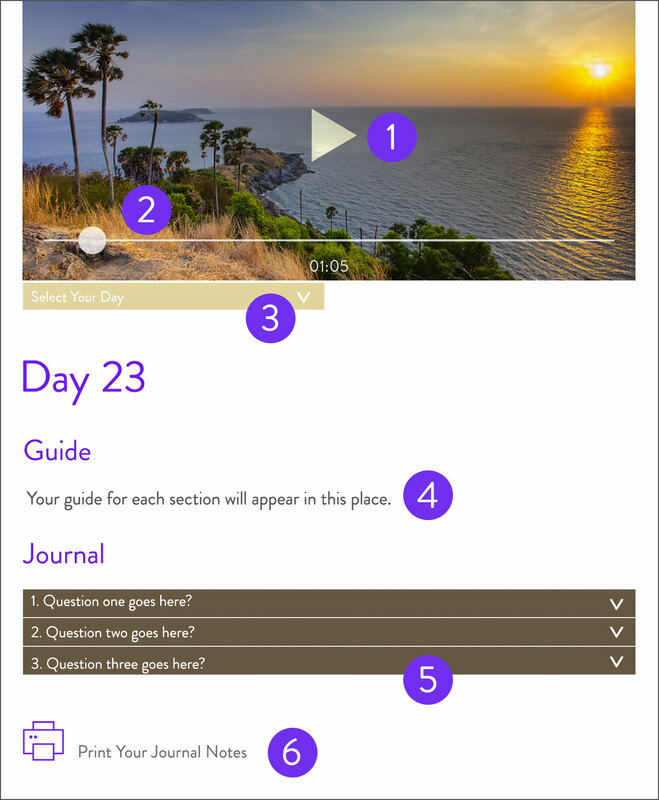 To switch between the guide, audio and journal pages you can either tap the text of the desired page you wish to go to or swipe your screen to the left or right to navigate between the pages. Your journal provides question prompts for you to consider. Tap on any journal question to open a text box. Once you have opened the text box, start typing your thoughts and observations. Before you leave the page or App remember to save your entries by clicking on the ‘Save’ button at the top right hand corner of the screen. Your journal will then be saved to your account and will be accessible on all your devices. Each one of our MindStore Online programs is founded on tools and techniques that have been developed over 25 years. They tap into our wealth of global experience in the Personal Development, Coaching, Meditation and Mindfulness fields. If you complete the program modules in sequence attentively you can expect your life to change for the better, and you will attract into your life experiences and outcomes that you would otherwise miss out on. We understand that there are times when impatience and even excitement about what is coming next may tempt you to want to jump forward; however we strongly recommend that you calm your enthusiasm and complete every part in turn. Please read the overview for each Module/Day before listening, as there will be important tips or necessary preparation. Please note that each Module/Day must be listened to in sequence.You will find that you will only be able to open a particular Module/Day if you have already listened to the previous one. Once a Module/Day has been completed then you can return to it whenever you wish. Remember at all time trust the process! Foundation is the name we give to the level of awareness that we reach with our relaxation method in all our programs. Foundation provides all the usual health benefits of Meditation, Mindfulness and Calm. However it also brings the opportunity to take advantage of enhanced thinking faculties, enabling access to your imagination and intuition. You will enjoy learning how we use our method to reach a deeply relaxed mindfulness state; it is easy to become quickly proficient and you always gain health benefits when you practise by yourself. Reaching ‘Foundation’ is a wonderful relaxing tool and achievement in itself. However, when it is combined with the practical tools and techniques that we are able to access through MindStore that it becomes very special. Use it as a daily resource for positively embracing constant change and manifesting what you truly desire. We strongly recommend that you adopt the best possible sitting position when you are practising or listening to your programs; however, feel free to do what works best for you. Unless it is absolutely necessary we would not recommend lying down, especially for beginners. Unless it is absolutely necessary we would not recommend lying down, especially for beginners. Sit in a chair and come to the edge of the seat, placing your feet firmly on the ground about shoulder width apart. If you need back support choose a firm backed chair. Position your knees over your ankles, shoulders directly over your hips, ears over your shoulders and rest your hands on your lap palms up. What is most important is that you are comfortable and relaxed and do what feels right for you. Many MindStore members access foundation while sitting up, supported with pillows in bed. First we gently turn up the tip of the tongue and touch the roof of the mouth directly behind the front two teeth. Secondly the Kubera Mudra works really well with all of our programmes; simply bring the tips of your thumb and first two fingers to gently touch on both hands, so that you are now sitting in a Buddha like pose. These are traditional techniques which we have found will help you to improve the quality of your relaxation and meditation. We strongly recommend you take the time to answer each of your journal questions immediately after each session. We also recommend that you revisit your previous session’s journal entries before starting on a new one. It is often helpful to add further comments or to take notes on any significant developments or breakthroughs before beginning the next session. It is more than likely that you will return regularly to your programs and/or individual modules. We find that it can be insightful to observe how your journal entries have developed over time. The Journal questions play a crucial role within each program, and are designed to make you observe and think about what you are experiencing.